St Seraphim Orthodox Cathedral is located just north of downtown Dallas and just south of the community of Highland Park. We are located at 4208 Wycliff Ave (Fitzhugh) a half block west of Oak Lawn Ave (Preston). Take Fitzhugh west and it becomes Wycliff. Enter the cathedral parking lot in the first block (one-way street) of Wycliff after crossing Oak Lawn. Exit at Oak Lawn Ave and go north. Turn left on Wycliff Ave. The Cathedral will be on the left. 6:30 PM Readers Vespers (Tuesday, Thursday, Friday); Daily Vespers (Monday and Wednesday). 9:30 AM Divine Liturgy is served in Slavonic on one Saturday a month and in Spanish on another Saturday during the month. Call for schedule. 6:30 PM Vespers with Litiya or Vigil as announced. 9:30 AM Divine Liturgy as announced. LENT: Canon of St Andrew of Crete, on the first Monday thru Thursday at 6:00 PM. HOLY WEEK: Evening services at 6:30 PM, Morning services at 9:30 AM. Call or visit our website for schedule. Established in 1954, St Seraphim Cathedral in Dallas is the third oldest operating parish in what has become the Diocese of the South, coming after only Hartshorne, OK and Miami, FL (SS Peter and Paul). 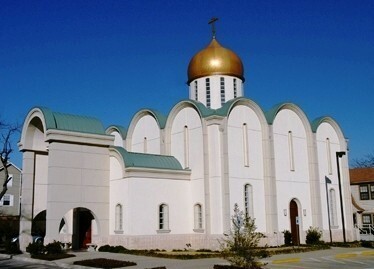 From the beginning, the parish was established as an all English-speaking Orthodox Church in Dallas. In April 1954, a group led by Subdeacon Dmitri Robert Royster (now Archbishop Dmitri of Dallas and the South), Fr Elias Rudolph (Mexican Orthodox Church) and Miss Dimitra Royster sought permission from their bishop to establish an English-speaking Orthodox Church in Dallas. Originally, the parish was part of the Ukrainian Orthodox Church, under Bishop Bogdon. Under the heavenly patronage of St Seraphim of Sarov, this group worked with St Nicholas Russian Orthodox Church (ROCOR) in Houston, under the pastoral leadership of Fr Alexander Chernay. Initially, services were held at the Sunday School building of St Matthew Episcopal Church in Dallas. In May, 1954, the parish purchased an 8-room, 3 story house on the corner of McKinney and and Blackburn St in Dallas, about 1 mile away from the present location, and built a chapel. This facility was shared with the St Nicholas parish. St Seraphim’s Church used this facility until 1956, at which time it gave the building to St Nicholas church. On November 6, Subdeacon Dmitri Royster was ordained to the Priesthood and assigned as Rector of St Seraphim’s. During the early years, as the parish could not support a full-time priest, Fr Dmitri taught at Southern Methodist University, yet never allowed his teaching to come between him and his parish duties. Fr Dmitri served the parish until he was consecrated bishop in June 1969, at which time he was named Auxiliary Bishop of the West, under Bishop John of San Francisco. In 1972, Bishop John assigned Bishop Dmitri to oversee St Seraphim’s, which he continues to do to the present as Bishop of Dallas and the South. In October 1956, property and a building at the present location of Throckmorton and Newtown Ave was purchased. The house was converted for use as a chapel, office, meeting room and kitchen. It was used until 1961, when a new church building was built. Fr Hillary (Madison), pastor of St John the Baptist Mexican Orthodox Church, began assisting Fr Royster at St Seraphim Church in 1954. During this time, Fr Hillary helped Fr Dmitri translate into English liturgical texts, music, and catechetical instructions. When St John Church closed in 1961, Fr Hillary and his parishioners joined St Seraphim. Fr Hillary remained with the parish until he was transferred to Los Angeles. In 1958, the parish was transferred from the Ukrainian Orthodox Church to the Russian Metropolia (now the OCA). The parish became a member of the Diocese of the South in 1978, at which time Bishop Dmitri was named Bishop of Dallas. In 1972 the parish purchased the current property on Wycliff Ave. Through the years, several parishioners of St Seraphim have been ordained to the Holy Orders. Included in this list are: Fr Stephen Fitzgerald (now Bishop Tikhon of San Francisco and the West), the late Igumen Gamaliel (Allman), Fr Basil Zebrun, Fr Basil Wagoner, Fr John Reeves, Fr Oreste Began, Fr Michael Dunbar, Fr Michael Butler, Fr Martin LeBrecht, Fr Ambrose Arrington, and Dn Patrick Gleason. In addition, 5 others served as deacons at the Cathedral. The parish has also taken an active role in the Missionary work of the Diocese of the South. St Seraphim’s Cathedral has assisted in the establishment of missions in Fort Worth, Paris, Lubbock, Plano, Dennison, Denton, Midland, Wichita Falls, Odessa, and the Valley. In 1996, plans were formulated to build a new, larger Cathedral building. The groundbreaking ceremonies took place on October 18, 1998. The first services in the new Cathedral took place on July 15-16, 2000, and during the Diocese of the South Assembly on the week of July 16, 2000. Interior and iconography work have begun. Over the years, the membership of the Cathedral has grown. As Dallas is a major business center in the southwest US, many people have moved into the area. Recently, a wave of Russian-speaking immigrants also has come to the Dallas area, resulting in a monthly Slavonic Liturgy at the Cathedral. Currently, the membership numbers over 150. Please visit when you are in the area.